With RAF Waddington's International Airshow sadly absent from the airshow calendar this year (and with no guarantee it will return in the future); it was left to a small grass airfield east of RAF Coningsby to provide Lincolnshire's largest airshow for 2015. Despite its short display line and limited capacity, East Kirkby Airshow is fast becoming a stalwart of the calendar - with each year providing top class display acts that get bigger and better each time. 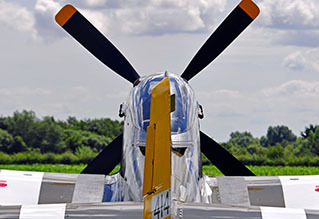 Dan Ledwood travelled to a sun kissed East Kirkby airfield to report for UK Airshow Review. Photography by the author. 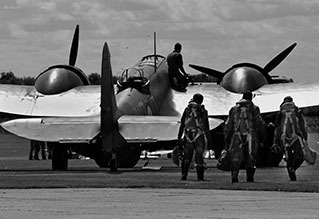 It’s not often an airshow could state that it will likely be the only UK venue of the year that will host a living and breathing Avro Lancaster. Due to the unfortunate engine problems encountered by the Battle of Britain Memorial Flight’s example earlier in the year, Just Jane was left with the task of providing the crowd with the distinct sound of four Rolls-Royce Merlins on one airframe. The organisers certainly made sure that her presence was felt throughout the day; quite rightly exploiting the fact that this may be the only time in 2015 that many enthusiasts would see a Lancaster operate. Three separate taxi runs were provided throughout the day, each offering rides to paying passengers. Accompanying Just Jane on her parades around the airfield was Douglas C-47A Dakota “Drag-‘Em-Oot”, sadly not being flown in 2015. 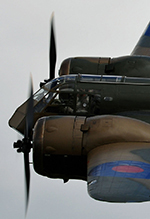 Nevertheless it was still commendable to see the D-Day veteran performing its own taxi runs alongside the Lancaster. Warbird aficionados were further catered for in the flying display, with several on show throughout the day and some participating in a final emotive flypast. Opening the show in earnest was Richard Lake's Spitfire XVI TD248 in the hands of Ian Smith (ex-BBMF OC), with the aircraft being flown in the perfect way for its type (in the opinion of the author) with big, gentle aerobatics and the occasional topside pass. Maurice Hammond flew a graceful, whistling routine in his immaculate P-51D Mustang “Janie”, with the Hardwick Warbirds owner also bringing his uniquely painted AT-6D Texan for static display. Not quite as quick but certainly just as beautiful was the inter-war Spartan 7W Executive, a chrome example being provided for the display from its home at Little Gransden. Peter Vacher also sent his Battle of Britain veteran Hawker Hurricane I R4118 - Carl Schofield flying arguably the best routine of the day with several close topside passes along the crowdline. Causing quite a stir on the UK airshow scene this year, and making its debut at East Kirkby, was the Bristol Blenheim IF. Even though the type has become synonymous in the hands of John Romain; for this show Lee Proudfoot was in the hotseat - his routine was a superb demonstration of the type, with minimal re-positioning time; the two Bristol Mercury engines purring as the aircraft danced between the shafts of sunlight. East Kirkby not only provided punchy warbird routines, but display acts that ensured that all spectators were catered for. The likes of Captain Neville’s Flying Circus; cavorting rather aimlessly through the sky in their mix of Tiger Moth, Thruxton Jackaroo, Chipmunk and Piel Emeraude, certainly provided several gasps and laughs from the crowd as the aircraft played “Aviation Ashes Cricket” and limbo amongst other antics. Peter Davies provided his usual polished routine in the Rotorsport Calidus - it can certainly be understood why the crowds at this year's Oshkosh found his display there brilliant! At totally the opposite end of the spectrum, and being arguably the most awe-inspiring act of the show was the “Little and Large” Extra duo. Taking the helm of the full-sized Extra 300S was Chris Burkett, with the 40% scale model being skilfully piloted by Mike Williams. It was certainly staggering to witness a small RC aeroplane being flown in a very similar manner to that of its larger sibling - with the model's thrust-to-weight ratio allowing it to literally hover on the prop. It’s certainly a display that needs to be seen to be believed and one that uses the spectator's sense of scale to great effect. 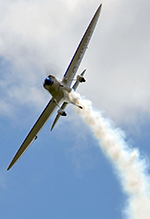 Aerobatics were provided by a number of other acts, with a good mix of different aerobatic methods. At one end of the spectrum was Rod Dean in the Bulldog T1 and Adrian Hatton in his home-built Silence Twister - both demonstrating the use of energy management in lower-powered aircraft. The latter type is very rarely seen on the display circuit outside of the Twister Duo, so it was certainly refreshing to see the local pilot performing elegant aerobatics in the Spitfire lookalike. In vast contrast to the aforementioned was Nigel Wilson in his Yak-52, combining fantastic lomcevaks with some closer flying. The final aerobatic act were East Kirkby regulars, and entertaining as ever, in the form of Wildcat Aerobatics flying two Pitts S-2B Specials. Special mention has to go to their commentator, who did a fine job of keeping the spectators engaged. The final setpiece of the show culminated in a salute to those who fought valiantly during the Battle of Britain 75 years ago, with the Blenheim being flown in formation with the Mustang and Hurricane whilst the Lancaster and Dakota sat on the runway as the trio flew overhead. It was certainly a unique selling point for the show - similar combinations, we hope, could be used to great effect in years to come. The flypast could have been even more impactful had the Hispano Buchon from Humberside Airport been able to attend, however the aircraft had to withdraw prior to the show. With ticket prices at a very reasonable £16.50 in advance, or £17.50 otherwise; it was certainly priced well for a show of its size. Bearing in mind that standard admission to the Lincolnshire Aviation Heritage Centre is normally £7.00 which, for anyone that hasn’t visited before, has a real period feel with the location befitting of what East Kirkby was like as a wartime bomber airfield. There were no tacky children’s rides or modern stalls in sight (their presence always somewhat questionable at an airshow) but instead plenty of interesting marquees including signings from several war veterans, including Dambuster legend Johnny Johnson - making for an experience that showed that loud and inappropriate side shows are not always necessary to captivate a crowd. The only real complaint would be that of obscured views. One of the show’s features that has the paying customer as a top priority is the provision of plastic chairs, however some seemed to perceive these as a set of ladders - meaning views for those sat further back were spoiled by those stood aloft. Overall, though, the show was a massive success; with the largest crowds ever seen at an East Kirkby show. Pleasant weather more than likely boosted those figures, and allowed for a healthy number of fly-in visitors with some interesting types gracing the airfield. A good varied line-up, possibly with the odd jet aircraft thrown in for a slightly more diverse display, would certainly make East Kirkby a show to entice enthusiasts from across the country. Hopefully the show can achieve just as much, if not more, success in the future with the ultimate goal of getting Just Jane into the air after so many years of hard work.